Lush, tropical landscaping is the essence of el palmar, a truly unique residence located in the heart of coral gables on one of its largest waterfront properties. A majestic, storybook setting crafted by renowned architect cesar molina and landscape artist raymond jungles. El palmar is showcased as art, with native species, a stunning koi pond and coral rock pathways harvested on site. An open family room, a quiet library, a 2,000-bottle wine cellar, an expansive kitchen, pub-style bar, living room with fireplace, a private service wing and an elevator. Impressive summer kitchen, large pool and boathouse offer the perfect environment to unwind. A private and custom 110x36 boat inlet keeps water-crafts & allows for uninterrupted water views - a total of 335+/- of water frontage. Unique estate home located on a peninsula in the exclusive gated community of tahiti beach island. The one offers 21,235 square feet of living space on a 62,051 square foot lot with 10 bedrooms and 10 ad half bathrooms with private sandy beach, expansive ocean view, soaring ceilings, wine cellar, media room with theater seating, gym, 2 kitchens, elevator, sauna, spa and beautiful outdoor area with lounge seating, bbq area and heated pool. The property offers ipad control system for lighting, music, air conditioning, tvs throughout the estate. The house was built in 2009 and has tuscan architecture exterior which was designed by famous architect ramon pacheco. The house was completely renovated in 2016. The 205 ft waterfront takes stage at the exceptionally detailed 7 bedrooms, / 8. 5 baths home spread over 4 magnificent acres. Complemented by elegant interior, a great foyer leads to spacious living areas, gourmet kitchen with sleek stainless-steel appliances, breakfast area, a formal dining room and a luxurious master suite upstairs with bathtub and marble floors. The property comes outfitted with amenities like a pool, spa, koi pond, tennis court, summer kitchen, barbeque area, large wine cellar, gym, game room, movie theater room and its own dock, providing boaters easy access to the bay and beyond. Elegant estate in exclusive, gated tahiti beach. Double height ceilings in living room to showcase prized art work, dining room for 12+. Den/library with built in wood shelves. Chef's kitchen with eat-in countertops, breakfast nook, gas ovens/6 burners, double refrigerator/freezer, full butler's pantry. Movie screening room with built-in bar & beverage center. A 2,500 bottle glass wine cellar with 3 temp. Controlled zones, large family room features a saltwater fish tank and backlit onyx full bar. Poker/card room with direct access to incredible covered patio that leads to pool, boat dock, home gym/sauna, health bar. One of miami-dade's largest waterfront residential parcels offering more than 3. 51 acres and +/- 430 ft of deep-water dockage. Located in gables estates, one of miami's most exclusive residential guard-gated communities. Direct ocean access from dock in minutes with no fixed bridges. Interior location provides added protection for large vessels. Widened canal offers ample turning basin. Membership application & approval required. Inquire for details. 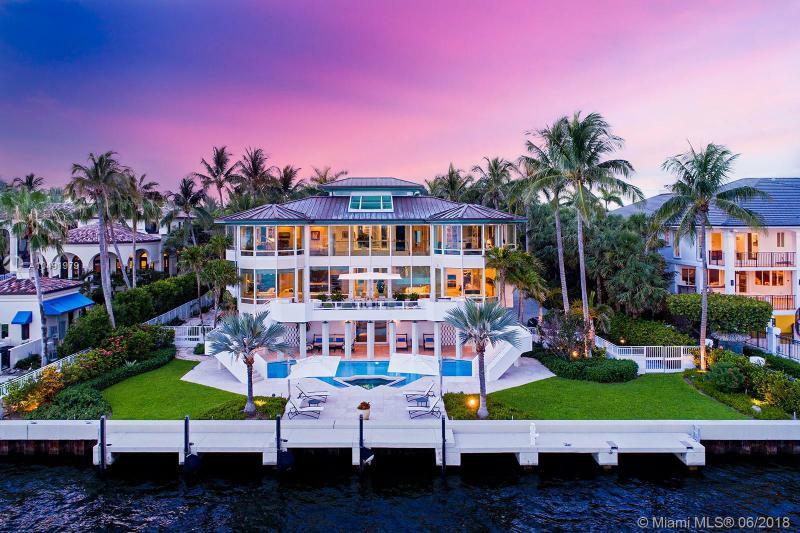 Nestled in one of the most exclusive gated communities - tahiti beach, this impressive home sits on nearly 1 acre featuring 121 feet of water frontage. Drive directly into paradise with a massive welcoming front yard. The home boasts 6 bedrooms and 7. 5 bathrooms of which are all ensuite. Picturesque views from every bedroom overlooking the bay and downtown miami skyline, the best views in miami. This tahiti beach residence offers luxurious floor to ceiling windows with an abundance of natural lighting throughout. Grand backyard paradise complete with a sparkling pool and spacious lounge area. Boaters dream mansion with direct access to biscayne bay. Located in the private guard gated community in cocoplum, tahiti beach, this elegant 15,563 sf 2-story estate boasts 7 large bedrooms/7 full 2 half baths and sits on a 49,000+ sf lot. Expansive 119 ft deep water frontage, private dock, open bay views and direct ocean access. Generous master suite includes sitting area, his and hers walk-in closets, sauna and private balcony. Double height ceilings in the impressive living room lead to media and recreation room complete with bar and impressive water views. Multiple terraces and balconies overlook the pool, waterway and views of the city skyline. Amenities include gym, office, fireplace, elevator, 3 car garage with lifts to accommodate 3 additional cars. Separate entrance to maids quarters which includes 1 bed/1 bath, living and kitchenette. Introducing a luxury, personal resort in a premium location by a leading residential developer, location development. Designed by csar molina. 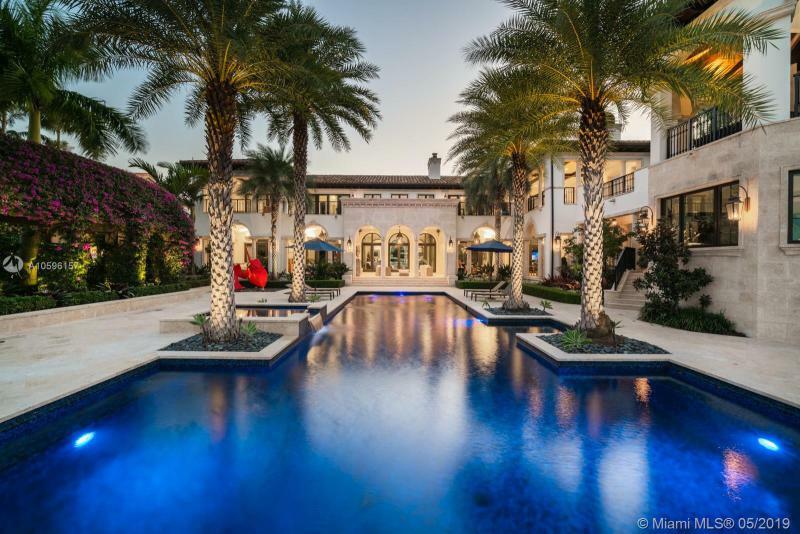 This truly exceptional, high-quality residence embodies the florida lifestyle, inside and out. The spacious floor plan highlights an indoor/outdoor lifestyle with large terraces, outdoor entertainment areas, and multiple bedrooms, featuring a master apartment and separate guest suite. A suite of thoughtfully-planned features and amenities that will provide incredible spaces to relax, entertain and experience the best that life has to offer. Complete home automation, wine room, media room, dedicated study, outdoor kitchen and fire pit, a lap pool, gym, hammam spa w/ steam room & hydrotherapy program. Garage fits up to 8 cars for an avid collector. Prime south miami location with access from 2 streets. Great opportunity to develop or update stand alone building. Sale includes adjacent vacant land (7109 sw 61 ct). As of today, 4/22/2019 the average home price for homes for sale in Coral Gables is $1,666,856. The data relating to real estate for sale on this web site comes in part from the participating Associations/MLS�s in the Southeast Florida Regional Multiple Listing Service cooperative agreement Realtor Association of Greater Miami and the Beaches, Realtor Association of Greater Ft. Lauderdale, Realtor Association of Miami-Dade County, Northwestern Dade Association of Realtors, South Broward Board of Realtors. The information being provided is for consumers' personal, non-commercial use and may not be used for any purpose other than to identify prospective properties consumers may be interested in purchasing. Data last updated: 4/22/19 EST/EDT EST/EDT.